Born: September 6, 1844 in Plymouth Ma. Died: December 18, 1931 in Bourne Ma. at 86 yrs, 3 mos, 12 d.
To: Richard Miller Devens; (1824 – 1900) (Samuel Devens & Rachel Nable Carver); Richard married (1) Catherine V. H. Oakes (1827 – 1855) in Cambridge Ma. on July 18, 1846. Married (2): April 2, 1901 in Norton Ma. To: Joseph Sylvan; (Abt.1821 – ?) 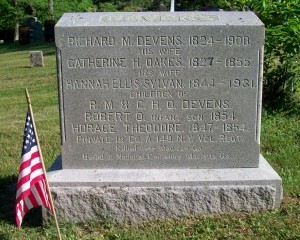 (Manuel Sylvan & Joaquin Louise (–)); Joseph married (1) Hannah Howes (1828 – 1894) (Nathan Howes, Capt. & Lydia Sears) in Dennis Ma. on November 17, 1859.